Dubbed as the "Land of the Smiles", Thailand is the most popular tourist destination in Southeast Asia. Most of you might know the reasons why? Its tropical climate like the rest of Southeast Asian countries, its being exotic, fascinating culture, great food and most of all the its beautiful beaches are only some of the reasons why. 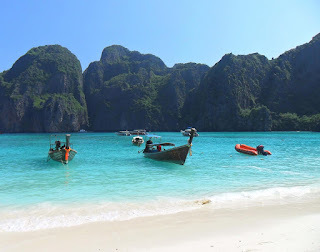 Thailand's beaches islands attract millions of visitors from all over the planet every year. You have to consider Thailand weather during your visit. With regards to the weather, the best time to visit this country is between November and February. There are relatively mild temperatures and cool breeze in the air during these months. Pattaya is one of the famous tourist resort on the Gulf Coast of Eastern Thailand. It is famous for its go-go and beer bars. The resort is also visited by holidaymakers from far and wide, and local families too. The beach is full of life with hotels, restaurants, shopping malls all along the road facing the beach. If you are quite a conservative type, this resort might not be suitable for you especially when seeing fat old men hand in hand with young Thai women. I remembered a friend who happened to take some days vacation in Phuket. She mentioned that this is such a beautiful place to spend a holiday considering its beautiful resorts and beaches. Kamara, Karon, Kat, Nai Thon and Nai Yang are some of its famous beaches. Sailing, yatching, diving and snorkeling are the famous water sports and activities in Phuket. Hua Hin and ideal getaway from Bangkok is known to be Thailand's oldest beach resort. Luxurious but affordable spa and Thai massage are well-known in this town. If you are in Bangkok, why not take a chance to explore its nearest island beach, the Ko Samet. It is famed for its white sandy beaches, exotic coral and crystal clear waters. Ko Samoi which is around 700 km away from Bangkok, is also worth to visit. This big island has a lot of famous beaches like Chaweng, Lamai, Laem Yai Choeng Mon, Mae Nam, Choeng Mon and some other worth to experience beaches. Stay safe when visiting Thailand and always be watchful of valuables and other personal belongings.